Where possible, try to plan more natural light for your kitchen. A huge fridge is a sign of a happy home… but is also a massive energy guzzler. If you’re thinking of getting a new kitchen, you have a golden opportunity to include some environment-friendly features that will not only save you money but will look amazing too. But first, you need to stop. Yes, stop. Stop ripping out those old cabinets right now. Because the chances are, all you need to do is change the doors and handles to transform a dark and dated 1990s wood look into… well, whatever you want. You might even be able to keep the doors themselves if you give them a careful lick of paint. But if you’ve given the cabinets a second look and still can’t bear them, take a little extra time to pull them out intact rather than destroying them. You can donate them to a second hand store or put them online for free. You can even stand them in the street for a day with a “take me” sign on them. Someone will want them and that will mean less waste in the landfill. • If you do decide to replace the cabinets, make sure that all materials for cupboard walls are recyclable, FSC-certified (Forest Stewardship Council) and formaldehyde-free. Try not to fall in love with a design before you’ve checked this out and ask the retailer to direct you only to kitchens that have these specifications. The more people demand these standards, the more retailers will stock them. • Your next consideration is water usage. Water is at an absolute premium in Malta. The aquifer is being mercilessly pumped at unsustainable levels; in other words, we’re taking out water that has taken hundreds of years to percolate into the water table way faster than rainfall can renew it. For every two litres going into the aquifer from rainfall, at least three are being pumped out. In addition, around 60% of Malta’s water comes from desalination but this requires a huge amount of energy to produce and the process can cause pollution. Consequently, water bills are at an all-time high, particularly since the price of water is linked to that of electricity. Reducing water wastage at home is key. Your kitchen taps should have water aerators, which provide good pressure with less water (it works by forcing the water through small holes). They can reduce usage at the kitchen sink by 25 per cent to 50 per cent. Touch sensitive taps help too. They are more hygienic since you can tap them with an elbow or back of the hand when your fingers are messy. But, more importantly, you can easily tap them off again to avoid wasting water. Some also have a low flow switch option. You can also get touchless options which will switch off automatically when you move your hands away or can be operated by a foot pedal. Ebay has several good options from around €100. • Large windows are important to help you reduce the amount of artificial light you need. Go for floor-to-ceiling windows if you can, or large patio door styles to create a feeling of light and space. Windows should be energy saving, keeping you cooler in summer and preserving heat during winter. Ensure that food preparation areas are near the windows to make the most of the natural light. Mirrors and light-coloured walls will help too. • The fridge is a major energy guzzler. Of all the new appliances you choose for the kitchen, this one is the most critical in terms of its environmental credentials. The EU energy efficiency ratings are A+, A++ and A+++ (the more pluses, the better the appliance is at saving you money). If you see an A-40 per cent that’s even better, since A+++ is equivalent to A-30 per cent (are you confused yet?). Once you’ve chosen the most energy-efficient fridge that you can afford, help it out by placing it away from sources of heat (the oven, the windows) and make sure food is cool before you put it into the fridge. • Granite is the countertop du jour, but these swanky surfaces have a dark side. Most granite is extracted by strip mining, which usually causes severe pollution, permanent land loss and provides poor conditions for overseas workers. A great alternative is a recycled stone-chipped composite countertop. It looks just as good but needs fewer resources to produce it. Friends of the Earth also recommends www.resilica.com. They make work surfaces made from 85 per cent recycled crushed glass, encased in a non-toxic coloured resin. Best of all, they can create any colour that you want so that the countertop becomes the perfect complement to your kitchen colour scheme. Set off your counter with a splashback of recycled glass tiles. 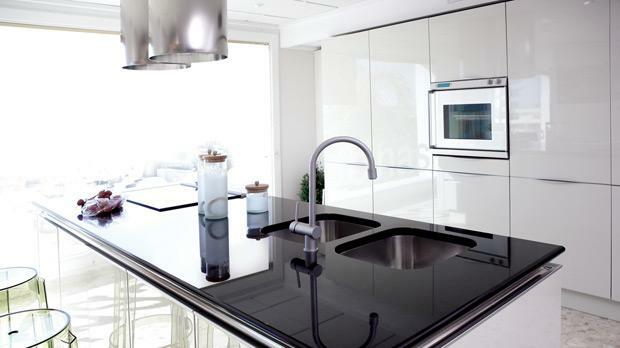 The glass reflects light, creating a visually spectacular display that will become the focal point of the kitchen. The website www.bottlealleyglass.co.uk offers a huge range of delicate, cutting edge designs and also provides worktops, lighting panels and tiles to match. The glass is as durable as granite and reduces landfill and wasted energy. • If you’re lucky, you’ve got lovely, antique Maltese tiles. Replace the cracked ones, polish them and they’ll last for years. If you haven’t got tiles, try to find someone who is renovating an old building and getting rid of their tiles. The classic designs are always in vogue. If you’re not that lucky, think about lino. It’s got a bad rap, I know, due to those 1970s orange and brown swirls, and the way it used to end up full of holes in high-traffic areas. These days though, linoleum is hard wearing and made out of some excellent eco-friendly materials such as linseed. You can also use cork, which is renewable and hardwearing. FSC wood laminate is another good choice. • To finalise your green design, include a space to collect the recycling and a rack for growing your own herbs; you can’t get greener than that.